When something is called safe, this usually means that it is safe within certain reasonable limits and parameters. For example, a medication may be safe, for most people, under most circumstances, if taken in a certain amount. A choice motivated by safety may have other, unsafe consequences. For example, frail elderly people are sometimes moved out of their homes and into hospitals or skilled nursing homes with the claim that this will improve the person's safety. The safety provided is that daily medications will be supervised, the person will not need to engage in some potentially risky activities such as climbing stairs or cooking, and if the person falls down, someone there will be able to help the person get back up. However, the end result might be decidedly unsafe, including the dangers of transfer trauma, hospital delirium, elder abuse, hospital-acquired infections, depression, anxiety, and even a desire to die. ^ a b Charles G. Oakes, PhD, Blue Ember Technologies, LLC. "Safety versus Security in Fire Protection Planning Archived 2012-03-13 at the Wayback Machine,"The American Institute of Architects: Knowledge Communities, May 2009. Retrieved on June 22, 2011. ^ Neumann, Ann (February 2019). "Going to Extremes". Harper's Magazine. ISSN 0017-789X. Retrieved 2019-01-22. ^ "Proven Safety Countermeasures: Roundabouts". Federal Highway Administration. Archived from the original on 2012-07-31. Retrieved 2012-08-13. ^ Jeroen Johan de Hartog; Hanna Boogaard; Hans Nijland; Gerard Hoek (1 August 2010). "Do the Health Benefits of Cycling Outweigh the Risks?". Environmental Health Perspectives. 118: 1109–1116. doi:10.1289/ehp.0901747. PMC 2920084. PMID 20587380. Archived from the original on 26 June 2012. Retrieved 2012-08-13. ^ Rheinland, TÜV. "Pressure Vessel Inspection According to ASME". www.tuv.com. Archived from the original on 14 January 2017. Retrieved 2 May 2018. ^ "Nationally Recognized Testing Laboratories (NRTLs) - Occupational Safety and Health Administration". www.osha.gov. Archived from the original on 8 April 2018. Retrieved 2 May 2018. Wildavsky, Aaron; Wildavsky, Adam (2008). 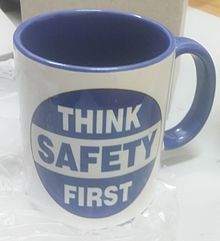 "Risk and Safety". In David R. Henderson (ed.). Concise Encyclopedia of Economics (2nd ed.). Indianapolis: Library of Economics and Liberty. ISBN 978-0865976658. OCLC 237794267.